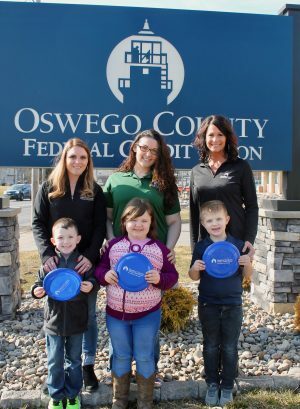 Oswego County Federal Credit Union is promoting smart and safe financial decision making for young adults this April as it celebrate Youth Month. Youth Month is a perfect opportunity to encourage children and young adults to enhance their knowledge about finance, said Bill Carhart, OCFCU CEO. “Youth Month gives children an incentive to begin saving the money they earn so they can attain their dreams of a happy future,” Carhart said. “As part of this year’s theme: ‘The future is yours. Picture it, save for it, share it.,’ we are encouraging our members under the age of 18 to take a picture of themselves, or something they’d like to save for, and share it on our OCFCU Facebook page: https://www.facebook.com/OCFCU/with the hashtag #OCFCUYOUTHMONTH. Oswego County Federal Credit Union is promoting smart and safe financial decision making for young adults this April. OCFCU staff from the Fulton office who marked the occasion recently, were, from left (back row): Rachael Ives, Fulton branch manager; Cheyenne Manford, member solution representative; Danielle Hayden, business development specialist; and front row (from left): J.C. Blackwell, Sophia Spaulding, Aiden Kingsley. OCFCU’s STAGES program provides pre-teens and teens the opportunity to learn how to handle money responsibly and arm them with good financial life skills, said Danielle Hayden, OCFCU business development specialist. “For example, our A’s Create Educational Savings (ACES) program puts extra money in a child’s savings when they earn A’s on their report cards,: she saud. “Every child who participates receives $1.50 for each A or 90+ on their report card, which is deposited in a separate savings account that cannot be accessed until they are 18. It’s one way to help motivate our younger members to earn better grades, while earning money toward college or other future goals. If you live, work, worship or attend school in Oswego County, you are eligible to join our family. OCFCU was chartered in 1975 and serves residents and business owners of Oswego County. OCFCU serves over 12,000 members throughout the county. For further information visit www.oswegofcu.org. Offices are located at 90 E. Bridge St. Oswego, 300 W. First St., Oswego, 707 S. Fourth St., Fulton, and 5828 Scenic Avenue (Route 3), Mexico.